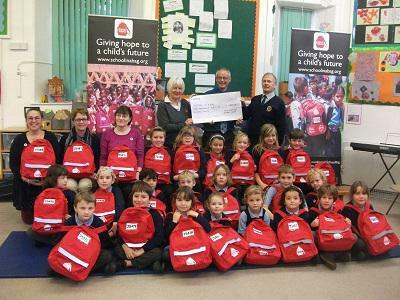 Our chosen charity for 2014-2015 was School in a bag (SIAB) this charity was first introduced to us by Holsworthy Rotary Club over a year ago. Since then the school has been busy fundraising in order to raise enough money for every child in the school to pack a bag. Fundraising events have included a coffee morning and book fayre, a Christmas craft stall, and tuck shop organised and run by the school council. Total funds raised by the school were over £340 and together with the Rotary club we have raised £1500. This week members of Holsworthy Rotary and representatives from SIAB came to Black Torrington with all the items for the bags. They worked with the children to help them pack a bag each and allocate a number to it. These bags will be going to disadvantaged children in other parts of the world, and soon we will be able to find out which country ours have gone to. Many thanks to the charity and Holsworthy Rotary for supporting us in our fundraising this year.